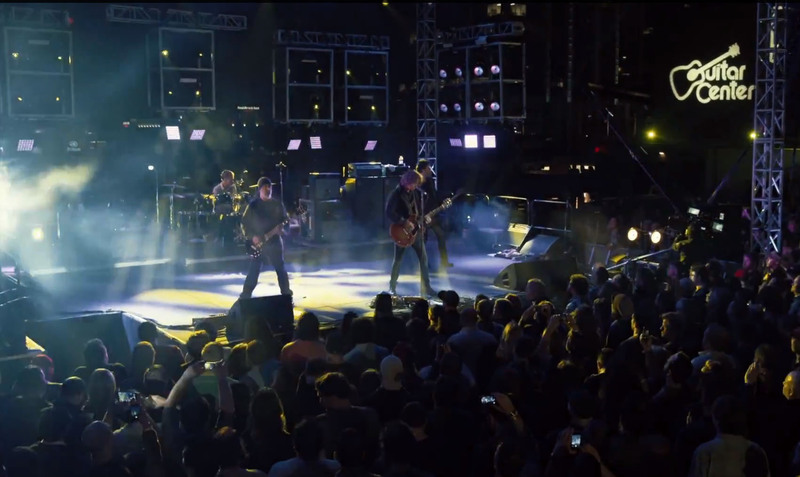 Alternative rock legends Soundgarden perform as part of season 8 of Guitar Center Sessions. Series moves to an exciting new time slot – Sunday nights at 8 p.m.
Los Angeles, CA (April 21, 2014): New episodes of the award-winning music television series Guitar Center Sessions presented by JBL will begin airing Sunday, May 4, 2014. Now in its landmark 8th season, Guitar Center Sessions has been tuned into more than 15 million times since December, and is moving to an exciting new Sunday night time slot, airing inspiring performances each week at 8 p.m. exclusively on DIRECTV’s Audience (channel 239). Season 8 will feature notable artists including Snoop Dogg, Alice in Chains, Damon Albarn, Phantogram, CHVRCHES, Cage the Elephant and more. It all kicks off with Seattle rock band Soundgarden performing songs that span their entire catalog. This episode, among others this season, was filmed live at SXSW, on a rooftop perched high above the crowds with Austin’s majestic skyline as a backdrop. Photo Caption: Alternative rock legends Soundgarden perform as part of season 8 of Guitar Center Sessions. DIRECTV (NASDAQ: DTV) is one of the world’s leading providers of digital television entertainment services delivering a premium video experience through state-of-the-art technology, unmatched programming and industry leading customer service to more than 37 million customers in the U.S. and Latin America. In the U.S., DIRECTV offers its over 20 million customers access to more than 195 HD channels and Dolby-Digital® 5.1 theater-quality sound, access to exclusive sports programming such as NFL SUNDAY TICKET™, Emmy-award winning technology and higher customer satisfaction than the leading cable companies for 13 years running. DIRECTV Latin America, through its subsidiaries and affiliated companies in Brazil, Mexico, Argentina, Venezuela, Colombia, and other Latin American countries, leads the pay TV category in technology, programming and service, delivering an unrivaled digital television experience to more than 17 million customers. DIRECTV sports and entertainment properties include two Regional Sports Networks (Rocky Mountain and Pittsburgh), and minority ownership interests in Root Sports Northwest and Game Show Network. For the most up-to-date information on DIRECTV, please visit www.directv.com .